As awards season draws closer, more and more films with Oscar hopes start crawling out from the woodwork. There is bound to a period piece somewhere along the line, but not usually in the same vein as Brooklyn. While many period pieces are more dramatic or biographical, this steps into the romantic side with one toe in the dramatic hardships of immigrants coming to America. It balanced wonderfully and it all centers around one young woman and her growth along the way. In the 1950s Brooklyn, an Irish immigrant named Eilis Lacey (Saoirse Ronan) falls for an Italian plumber, Tony Fiorello (Emory Cohen). Her homesickness begins to fade until tragedy strikes at home and she is compelled to travel back to Ireland. While there her love is questioned as she spends more and more time with Jim Farrell (Domhnall Gleeson). There is something to be said about a period piece that doesn’t rely on its period too much. 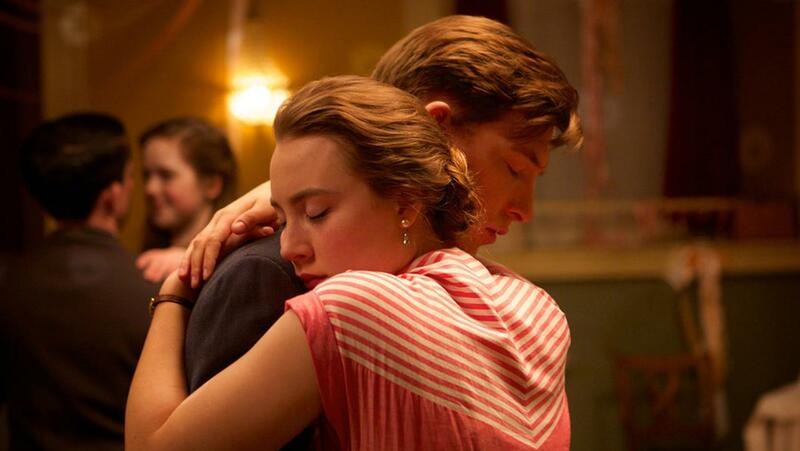 Brooklyn is about the characters and the relationships between these very real feeling individuals. The emotion is there and can be completely relatable to anyone who has been away from home for an extended period of time. Brooklyn is delightful for anyone viewing it and this is in large part to the incredibly likeable performances of Emory Cohen, as the loving Italian man who just wants to be with Eilis, and Domhnall Gleeson, as the ever-charming man who Eilis is drawn to in her homeland. There is also plenty of room for veterans like Jim Broadbent as Father Flood or Julie Walters as the hilarious Mrs. Kehoe. But the real standout is Saoirse Ronan. The young actress gives a performance that relies heavily on subtlety to make the audience care about Eilis. Her performance is understated and elegant and certainly warrants some award conversation. Adapted from Colm Tólbin’s novel of the same name by screenwriter Nick Hornby, Brooklyn is a gorgeous film to look at while maintaining a classic love story packed with emotions. All this must be credited to director John Crowley. Using close-ups of Ronan and just the right shots, Crowley knows how to capture the subtle inner turmoil throughout Eilis’ journey. So what did you think of Brooklyn? Have you seen it and what's your favorite romantic film of all time? Comment below and let me know and as always return to I Am Sam for weekly reviews.